Last year, some KFC restaurant franchisees in the South and Midwest replaced their PIN-based time and attendance systems with DigitalPersona’s U.are.U fingerprint scanners in a bid to reduce fraud. In April, restaurant chain Hooters replaced the PIN and magnetic stripe card system used to log both transactions and work hours by more than 4,000 employees. The moved to a new solution that uses biometric fingerprints, a move that reduced transaction and payroll fraud while also eliminating the cost of replacing lost ID cards, says Wes Marco, director of information systems at the chain. The costs savings could be considerable. The American Payroll Association estimates fraudulent time clock usage costs businesses 1.5% to 5% of gross payroll annually. According to a Nucleus Research study, the cost of buddy-punching, or having a friend or coworker clock in for an employee who has not yet arrived or has gone home early, accounts for 2.2% of gross payroll. Fingerprint scanners can be integrated into already existing employee databases for punching in and out, Oberman says. Deployment doesn’t take long. “The average business can install software and readers and be up and running in 45 minutes or less with integration with other software,” says Neal Katz, vice president of operations at Count Me In, a software developer that integrates biometric readers into existing systems and offers its Timecard Monitor time and attendance solution. Clients using its biometric time and attendance solutions include Dunkin Donuts, Huntington Learning Centers and FTD florists. Most fingerprint scanner systems do not store an actual image of employee fingerprints. Instead they record a template–an encrypted, mathematical representation of the fingerprint generated with a proprietary algorithm. The stored data can’t be used to reconstruct an image of a fingerprint, and is not linked in any way to any criminal or government databases. For other employees, it can act as a deterrent. “Even though the technology doesn’t tie into any other government databases, our clients have told us it has weeded out some applicants,” who fear that their fingerprint could be matched with other unsavory information, Katz says. A small medical practice that installed a fingerprint system had two employees immediately quit, explains Katz. “Apparently, they had made a habit of not physically being at work for all of the hours they claimed,” he said. 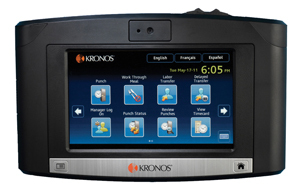 Kronos sells a variety of biometric time and attendance products, such as Kronos 4500, 4500 Touch ID, and 4510 Touch ID terminals. Employees can use a badge or fingerprint to clock in using the terminal, and can access information on how many hours they’ve worked, view their schedules, and the amount of time off they have available. ADP offers biometric time and attendance products with the option of hand or fingerprint scanning. Small players are also vying to fill the small-business segment of the market, selling low-cost bundles including both software and fingerprint scanners. DigitalPersona sells the U.are.U series of fingerprint scanners, offering a USB fingerprint reader compatible with desktop and laptop PCs; a heavy-duty scanner for high-traffic locations such as kiosks, point-of-sale terminals, time and attendance terminals, and physical entry devices; and a Windows-compatible keyboard with a built-in fingerprint scanner, for use with desktop computers and point-of-sale terminals. The readers and software are compatible with Windows and Linux-based systems as well as accounting software such as Quickbooks, Peachtree, and Paychex systems. Other companies are trying to solve complicated time clock issues with other solutions. In May, Utah-based FotoPunch launched FotoPunch Connect, Mobile Time and Attendance, which turns a cell phone into a geolocated biometric time clock. Employers can track the employee’s hours, location and identity, as well as track job costs and collect work-related photos, all without the purchase of additional hardware. Employees clock in to by taking a photo with their smart phone. Nucleus Research said the product’s benefits include increased manager and employee productivity, reduced payroll costs, and the savings associated with not buying new hardware. Biometric time and attendance solutions are now used in a wide range of industries, from food service and retail to hospitals, daycare and financial services.